Bromley Relief in Need – BRIN was formed in 1973 by the amalgamation of several ancient local charities that have a history that stretches back over three hundred and eighty years. It would appear that the residents of Bromley have a tradition of trying to provide help to those less fortunate. 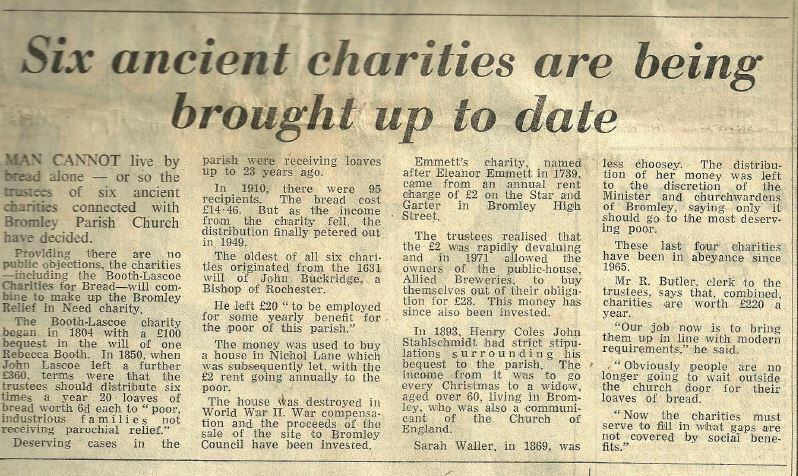 Recently we discovered a box full of newspaper clippings, minutes of meetings (some in beautiful copperplate handwriting), details of charitable organisations and trusts that over the years have sought to provide succour to fellow residents who have fallen on hard times. The documents provide a fascinating window on part of the social history of our Borough. Whilst Bromley Relief in Need, BRIN, has adapted to modern times and needs, it can be traced back to various local charities: the oldest being that of John Buckridge, Bishop of Rochester, whose 1631 will left some money for the benefit of the poor of the parish. Since then other charities have joined with BRIN, most recently in 2002 the Bromley Benevolent Association amalgamated with BRIN, which enabled us to increase the area we cover and our investments and income. Originally BRIN only served the people within ‘The Ancient Borough of Bromley’. We now cover the entire modern London Borough of Bromley.